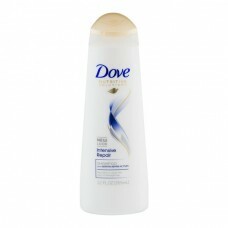 Dove Intensive Repair Shampoo New look. Nutritive solutions. With keratin repair actives. Nourishes to repair the signs of damaged hair. At Dove we are dedicated to providing superior nourishment solutions for hair. We believe that if you want to achieve real results you need real care that works hard each time you use it. That is why we create our products with 2 way care, to provide both instant and long term results. So over time your hair gets better and better. Dove Intensive Repair Shampoo and Conditioner, with keratin repair actives, works immediately to repair the hair surface, while deeply nourishing the core of your hair to reconstruct it from within and make it healthier in the long run. Every time you use it, your hair is repaired, strong, and beautiful. Dove is a registered trademark. Questions or comments? Call 1-800-761-DOVE (3683) or visit us at www.dove.com. ©Unilever.